This book seeks to rectify misrepresentations of Popperian thought with a historical approach to Popper’s philosophy, an approach which applies his own mature view, that we gain knowledge through conjectures and refutations, to his own development, by portraying him in his intellectual growth as just such a series. 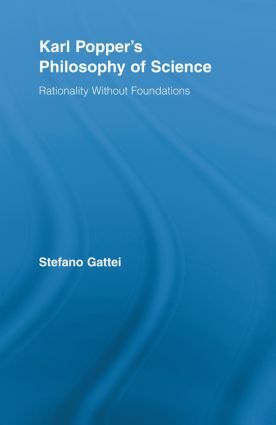 Gattei seeks to reconstruct the logic of Popper’s development, in order to show how one problem and its tentative solution led to a new problem. "Looking back at the philosophical literature of the mid-twentieth-century, we find most of its classics sink into oblivion and others shrink in significance, while the writings of Karl Popper loom ever larger. Young readers want to know why. A book that answers this question must be faithful to the original, offer intelligent perspectives, and above all be reader-friendly. Any work that answers this requirement is welcome. Stefano Gattei answers these criteria with flying colors. Popper's theory of science is the first and still the only one that explains the great intellectual value of both Newton's and Einstein's theory of gravity while recognizing the superiority of the latter. In the same manner it is still the only theory of knowledge that makes sense of parliamentary democracy. It is not the last word, as Popper's followers have offered criticism and modifications of his ideas. In the spirit of Popper's philosophy, Gattei ménages to present these criticisms of the master respectfully, in a remarkable sense of proportion." "Gattei's impressive book offers a very effective reading and defence of the crucial aspects of Karl Popper's philosophy of natural science. It makes excellent use of recently-published work on the early phases of Popper's career, and guides the reader through the development of Popper's views in a way that is both original and valuable. The stark confrontation it presents between Popper's views and those of Thomas Kuhn is something that philosophers of science must now address." Stefano Gattei graduated in Philosophy in Milan and was awarded a Ph.D. in Philosophy of Science at the University of Bristol, with a dissertation on Thomas Kuhn’s "linguistic turn" and the legacy of Logical Positivism. After lecturing in Milan, Padua, Vercelli and Pisa, he was fellow at Columbia University and is currently assistant professor at the IMT Institute for Advanced Studies, Lucca. He has published widely on contemporary issues in the philosophy of science, ranging from the incommensurability thesis, the dynamic of conceptual change, rationality, relativism, and relativism. Presently, he is a member of the Philosophy of Science Association, of the British Society for the Philosophy of Science, of the SILFS, Società Italiana di Logica e Filosofia delle Scienze and of the Società italiana di storici della fisica e dell'astronomia.